Intel Core i7 8559U Kaby Lake R Hotovo! Intel Iris Plus Graphics 655 Hotovo! 4,5 GHz (4 500 MHz) Hotovo! For shipping to other EU countries visit this page MacBook Pro 13" Retina ENG 2018 with Touch Bar Silver. 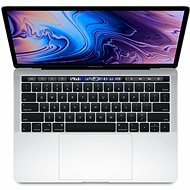 Für Versand nach Deutschland, besuchen Sie bitte MacBook Pro 13" Retina ENG 2018 mit Touch Bar Silber. Chcete doručiť tovar na Slovensko? Prezrite si MacBook Pro 13" Retina ENG 2018 s Touch Barom Strieborný. For shipping to the United Kingdom visit this page MacBook Pro 13" Retina ENG 2018 with Touch Bar Silver.